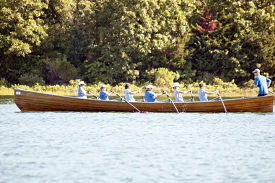 Dartmouth, MA – For the first time in Dartmouth’s 350-year history, an eight-oared racing shell (in addition to two four-oared racing shells) were seen streaking across the waters of the Slocum River estuary on Saturday morning, competing in the Lloyd Center’s ninth annual Slocum Challenge Regatta. What a great way to celebrate National Estuary Day, as well as the town’s 350th birthday! Saturday, September 27, the Lloyd Center’s Slocum Challenge Regatta brought just under a hundred competitors out to the beautiful Slocum River Estuary. 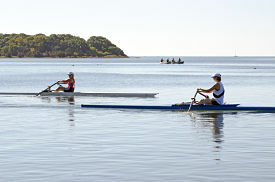 The race, a two-mile loop course held on the Slocum River in Dartmouth, Massachusetts, is held annually to benefit the Center’s estuary education programs that promote stewardship of the river. One competitor, Christine Vezetinski of Westport, MA competed in the Women’s Veteran Single Open-Water-III Shells, setting a new division course record of 20:30.2. What makes her so different from the Regatta’s other competitors? This year, Christine had a special coach to help her beat her previous course record set in 2012. Her special coach was her daughter, Lieutenant Catherine Abigail Burke Reppert, a Surface Warfare Officer currently stationed on USS TRUXTUN (DDG 103). Lieutenant Reppert came home for the weekend as a surprise visit before rejoining her ship on deployment in the Arabian Gulf.” The Lieutenant rowed the course beside her mother, instructing her throughout the race. A fantastic memory that the two will share for years to come. The regatta is open to racing shells, open-water shells, kayaks, canoes, surf-skis, rowing crafts, whaleboats, pilot gigs, and stand-up paddleboards, with separate age-categories for competitors under 20, over 50, and over 65, all in Men’s, Women’s and “Mixed” (co-ed) divisions. As always, the emphasis of the regatta is on good fun and enjoyment of the scenic Slocum River. The Lloyd Center would like to thank everyone that made this event possible – our dedicated Slocum Challenge Regatta Committee, Sponsors, volunteers & competitors. We gratefully acknowledge and thank each of you for your support, time and hard work! Special thanks to: Steve Melo, Dartmouth Harbor Master, Chadwick’s Awards, CV Liquors, Dartmouth Fire Station – District 2, Diversified Marketing Group, M & M Auto Service, New Bedford Yacht Club, and Noquochoke Orchards.